Last night I realized I have not posted any sweet/dessert recipes for this week. Going by my sweet tooth and how I have been updating my blog, I wanted to post a dessert to welcome the weekend 🙂 As I have said many a times on this blog, I love sweets. That said, I don’t particularly like butter-milk or yogurt. So Amma used to make me a cup of fresh curd every day growing up. I used to beat it with a tsp of sugar and enjoy it as a dessert 😀 I still do it sometimes these days as well, but then keeping in mind the additional calories, fitness regime etc etc (basically the boring grown up stuff), I just gulp down plain curd – just for the nutritional value. Last weekend, when I was craving for some dessert I looked into the refrigerator to find some inspiration. Find I did, a big bowl of curd. My initial thought was to prepare frozen fruit yogurt – as I had some mangoes and oranges. 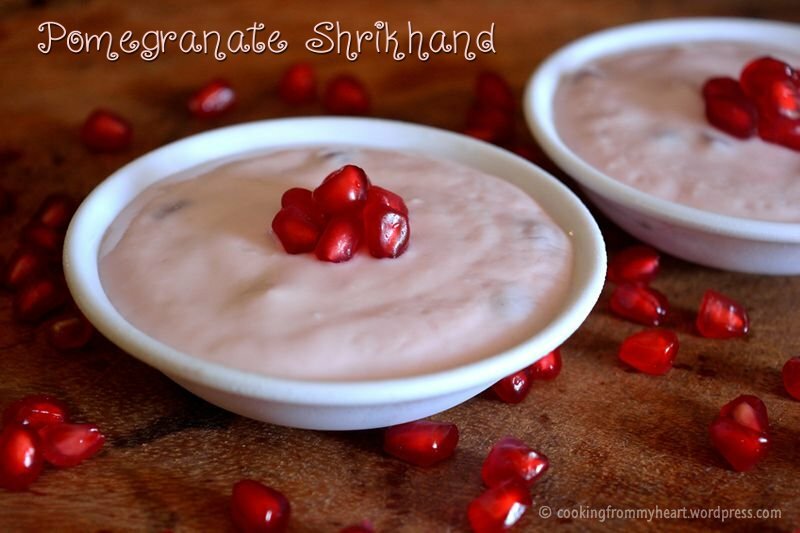 Then, the wild me decided to use pomegranate and I ended up making some shrikhand. Shrikhand is a rich creamy dessert made with hung curd. It has to be one of the easiest desserts one can make. 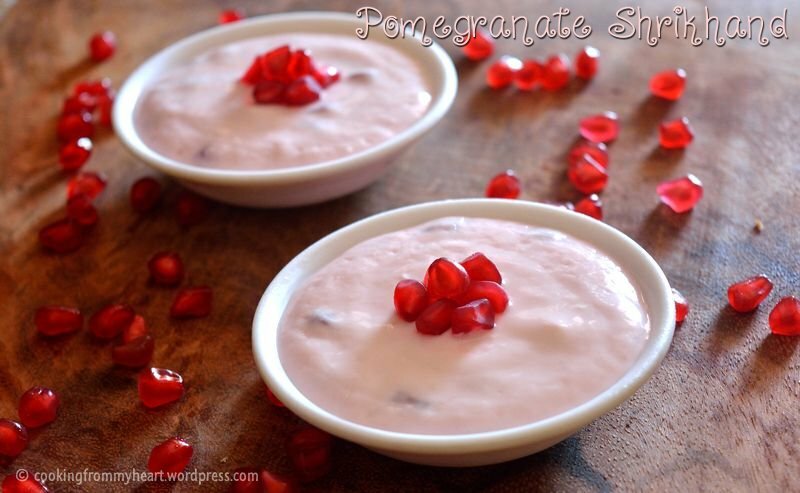 I loved the pale pink colored shrikhand, thanks to the pomegranate juice. I also added some fresh pomegranate into the shrikhand and used some for garnish. One of the good things is, with pomegranate being added, the amount of sugar used for sweetness is too less – making this guilt-free. In a muslin cloth, hang the curd for 1 hour to drain the excess water. Even though the curd used is thick, you would not believe the amount of extra water/whey comes out on straining. Hang the cloth on a cupboard handle and place a bowl beneath. The more you hang the curd, the more thicker/creamier curd you will get. Remove the hung curd and the curd should be solid, in a ball. Should yield about a cup of solid curd. Remove it onto a plate. In a blender, add the pomegranate kernels and blend for 2-3 mins. Strain the juice onto a bowl. Add the juice to the hung thick solid curd. Mix well. Add the sugar and mix until dissolved. 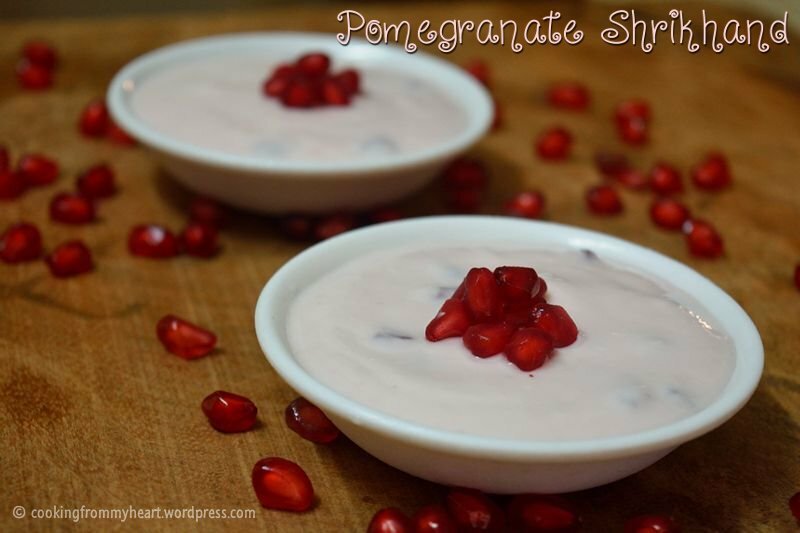 Also stir in some pomegranate kernels into the curd. Set the Shrikhand in serving bowls and put them in the refrigerator. Serve chilled with some pomegranate kernels on top. Hanging of the curd and straining as much water as possible is the single crucial step of preparing Shrikhand. Adjust the quantity of sugar as per preferences. As I added pomegranate juice, I did not add much sugar. Serve the Shrikhand chilled for better taste results. The additional shrikhand can be frozen too and stays good for days. 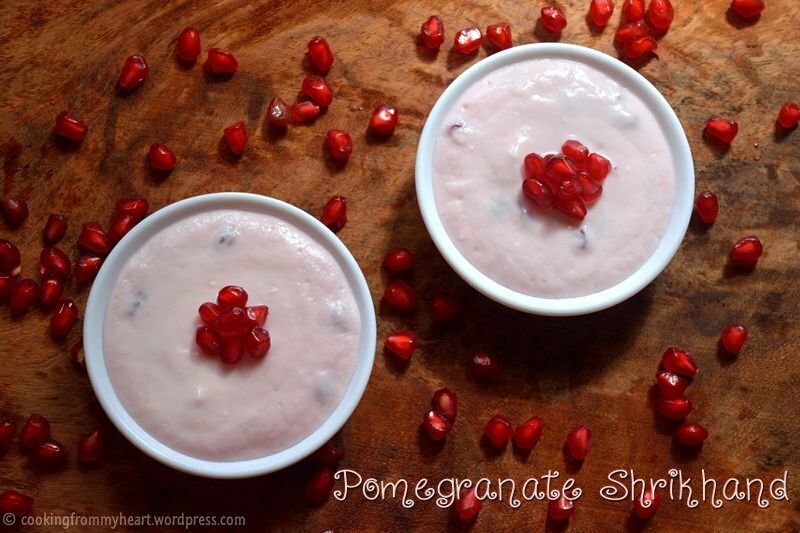 Adding pomegranate kernels to the Shrikhand is optional. If you wish a creamier version, skip that step. I liked the bite those kernels gave. Love the top angle shot..
You wont believe but fermentation is a problem in Bangalore too. I have not managed to make good curd even once. I’ve always thought we had to spit them out and I think: this fruit is too high maintenance! I love anything pomegranate. This look delish.